But figuring out how much $100 will grow over 10, 20, or 30+ years is not a natural act for most of us. 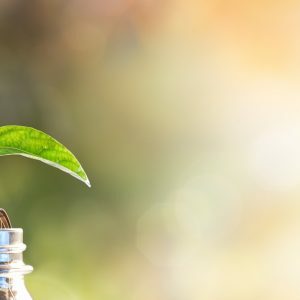 Luckily, a simple rule of thumb can remove some of the mystique around how compound interest works and how inflation can erode this magical phenomenon. Let’s say you are presented with two investment opportunities for an investment of $100. One opportunity is paying you 2% a year and the other is returning 6% per year. All else equal, most of us can surmise that the investment paying 6% per year is better than the one paying 2% per year. But you also must factor in inflation to better understand how much better the 6% return is for your future self. 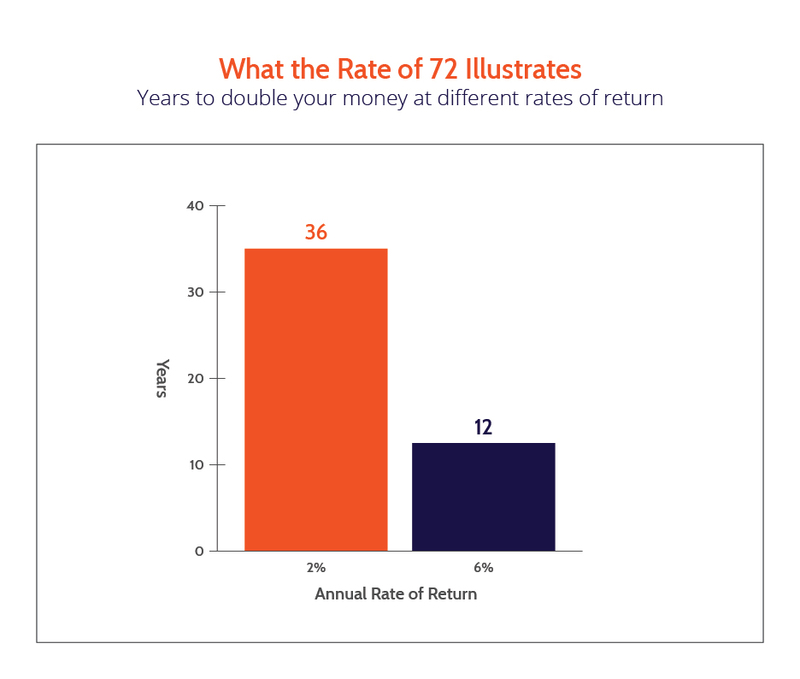 Enter the “rule of 72.” The rule of 72 says that an investment will double in value when the annual return multiplied by the number of years equals 72. 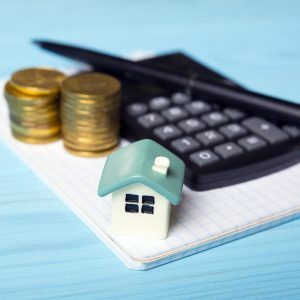 Coming back to our two hypothetical investments and applying the rule of 72, we find that it will take 36 years for the investment returning 2% to double in value. You arrive at that by taking 72 and dividing by 2 to get 36. For the investment returning 6% per year, we find that it will take 12 years for your money to double, as 72 divided by 6 gives 12. Doubling one’s investment is a good thing, but the time element is key. The 2% investment will take 36 years to double, whereas the 6% investment will only take 12 years to double. If I presume my time horizon is 36 years, then $100 invested today will be worth $200 in 36 years. On the other hand, $100 invested at 6% will be worth $800. Wow! That $800 is a lot more than the $200, and it will obviously allow one to enjoy a much more robust lifestyle at retirement. But how did I make so much more? For the math on the 6% investment growing to $800, I take the fact that my money will double in 12 years from $100 to $200. That $200 will double again in another 12 years (12 times 6 is 72), so at the end of 24 years, I will have $400. That $400 will double again in yet another 12 years, so at the end of 36 years, I will have $800! That is a much more sizeable nest egg than I would have if my investment only earned 2%. Inflation and longevity (i.e. how long I will live and hence, how long my savings need to provide for my income in retirement) are key aspects of any retirement planning approach. Inflation is a measure of the buying power of a dollar. It tells us how much more an item will cost down the road due to the costs of producing something (labor, materials, etc.) going up over time. That loaf of bread that you buy today for, say, $2 would have only cost about 50 cents a few decades ago. On the flip side, that loaf of bread will cost $4 to $6 in a couple of decades due to inflation. It is imperative that you compare what your investments are returning to inflation to ensure you are maintaining (or hopefully increasing) your buying power. So, let’s come back to our two hypothetical investments of $100. One is earning 2% per year and one is earning 6% per year. One investment will double in 36 years and the other will double in 12 years (or be worth $800 in 36 years). Currently, inflation is at roughly 2%, so that loaf bread that costs you $2 today will cost $4 in 36 years. If my investment return on my $100 is only 2% per year, then while I will have $200 in 36 years, my “purchasing power” will not have changed at all. I would be able to buy 50 loaves of bread today ($100 divided by $2 each) or 50 loaves of bread in 36 years ($200 divided by $4 each). My investment that is earning 6% a year, on the other hand, will increase my purchasing power substantially if inflation is only 2% per year. With my initial investment, I can buy 50 loaves of bread today or 200 loaves of bread in 36 years. I arrive at the 200 loaves based on my $100 investment growing to $800 at 6% per year and the future value of the loaf of bread is $4 in 36 years. If we were to return to a higher inflationary period (see the early 1980s when inflation peaked at almost 15%! ), my purchasing power would be eroded if I have locked in an investment that only earns 2% per year over the 36-year period. For example, if inflation were to average 4% per year over the next 36 years and I only earned 2% per year, I could only buy 25 loaves of bread, as the price of a loaf of bread would then be $8 per loaf and my investment would only be worth $200 ($200 divided by $8 is 25). All of this is very interesting, but these time horizons seem very long, don’t they? Based on the Social Security Life Expectancy table for 2014, the average expected remaining life of a 50-year-old female is 33 years. Given how life expectancy continues to increase due to medical advancements, it would not be surprising to see that 50-year-old female today (2018) live for 36 more years. If she has invested her $100 in savings at 2% and inflation is 4% per year, she will not be eating a lot of bread in her 80s. Rather, it will more than likely be lower-grade cat food! 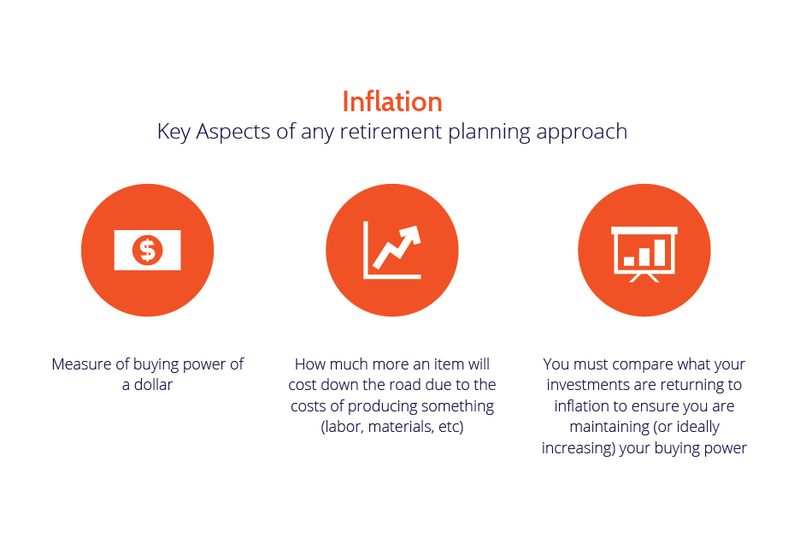 You need to ensure that your investment return is at or above the expected level of inflation to enable you to enjoy the lifestyle you deserve in retirement. 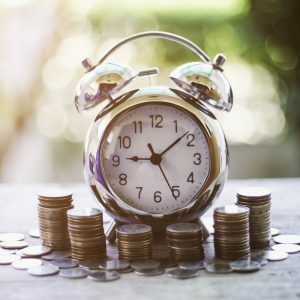 If you are struggling with how much income and purchasing power you will have in retirement, the rule of 72 and the magic of compound interest can be a guide to help you plan for your future. Craig Fowler has had various roles in the Life Insurance Industry in both the US and Canada over his roughly 30 years in the industry. These roles have included Corporate Development, head of lines of business, CFO/Chief Actuary, Treasurer, Risk Management and others that focused mainly on the Institutional side of the organizations. 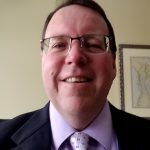 At this stage in Craig’s career, he is trying to focus more on the retail sides of the business to bring his experience to help individuals provide for their financial futures based on their goals and risk tolerances. Craig holds the FSA, FCIA, and CFA designations. He received his BSc, Actuarial Science, from the University of Western Ontario in London, Ontario, Canada.